Rooney successfully captures both the excitement of a political campaign and the ennui of a going-nowhere office job in this character-driven novel. In Kathleen Rooney’s novel O, Democracy!, working on a Senate reelection campaign can be as mundane, tedious, and inspiration-draining as any other office job. That’s by design, however, as the book itself is an expertly written story of a campaign staffer’s growing disenchantment and her sense that she’s wasting her life. O, Democracy! is far more of a character study than a plot-driven novel, and Rooney has created a strong central character in Colleen Dugan. The story takes place during the excitement of the 2008 election, but Colleen is just far enough removed to miss out on the national story. Instead, she works on the reelection campaign of the senior senator from Illinois in a race he’s expected to win handily against token Republican opposition. While others work on transforming politics, Colleen spends her days stuck in a Chicago office building, contending with the flirting of the chief of staff, her disconnect with her pregnant coworkers, and managing interns who remind her of her previous enthusiasm. Rooney does a nice job capturing both the excitement of 2008 in Democratic politics and the ennui of a going-nowhere office environment. Her characters have the friendship-by-necessity relationships of campaign workers, and their dialogue rings true for smart, ambitious people in varying degrees of limbo. Because the campaign is uncompetitive, plot points that would drive the narrative in a more traditional political story—a potential bombshell about the opponent, a gaffe in a speech, the introduction of an important bill—just become more reasons for Colleen to feel underutilized and unsure of what she should be doing with her life. This is a bold approach to a political story, and Rooney, a former Senate aid, pulls it off beautifully. The book takes great pains to avoid using any proper names, and this happens so often that it feels forced and distracting, particularly in dialogue or when referencing things like song lyrics, sports teams, or locations. Also, the book pauses periodically for short musings in the voice of the Founding Fathers looking at all the modern action—musings that are written well but impede the momentum of the story and feel tangential. They serve mainly to tell what Rooney is already showing successfully. 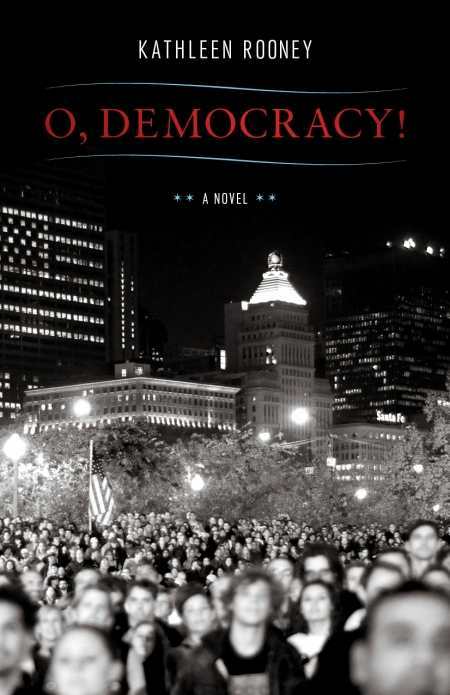 Gripping and engaging, O, Democracy! tells a truly day-to-day political story of stalled ambition and a character grappling with where it’s all going.